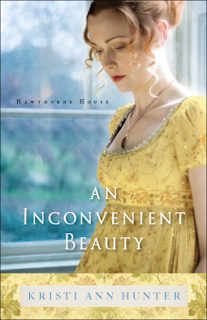 I thoroughly enjoyed the whole Hawthorne House series. I've been waiting for this fourth book to see who would be good enough for Griffith, the Duke of Riverton, to marry. It was refreshing that Frederica was not awed enough by a very eligible, pursuing duke to give up true love. I know that times were different back then, with such focus for young ladies to make worthy matches for financial and familial security, but I still felt badly for Isabella. Because of her uncle's intimidation, I had a difficult time connecting with her at first. But, by the time Bella 'visits the trees,' I liked her and could see a little more of the real Miss Breckenridge. I was a little surprised at the manipulation by Griffith's family. Then again, I've seen close families do all they can to matchmake – with the best of intentions, of course! Obviously, in the fictitious Hawthorne House, it all worked to their advantage and showed Griffith just what they wanted to show him! That the other girls were wrong...and true love is the only right! The book includes the rest of the family from the first three books: Miranda, Trent, Georgina and their spouses. Though you could probably read this book as a stand-a-lone, it is best if you read the entire series in order. A satisfying conclusion to the series!